In the Spring my brother and I began working on some renovations to an old house where we spent a good part of our childhood. The old 1930’s house is an architectural gem: inlaid hardwood floors, a beautiful mantle with leaded glass bookshelves on either side of the fireplace, a darling breakfast nook. Being able to spend time working on the old gal was a joy but what really moved me was all the fond childhood memories that came flooding back. As we sanded, taped and painted together, Andy and I reminisced about the old days and fond memories of the house. He was surprised that I could remember so many details about the house, our neighbourhood and our family’s activities. Every year about this time, I am transported back to one of my fondest childhood food memories: blueberry pie. My mother is the youngest of her family and that resulted in our fortune of having cousins that are much older than ourselves. 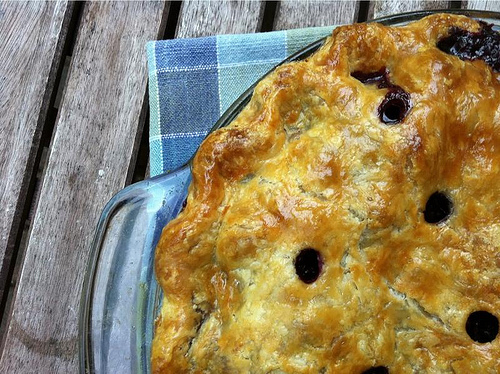 One summer my cousins dropped by with two white pails full of freshly picked blueberries that my mom magically transformed into a luscious blueberry pie. I remember the sweet, intoxicating scent of the pie wafting through the kitchen. And I can still taste the warm berries in their toasty, crumbly crust that forever tastes like summer. That blueberry pie, and I’m sure it was the only one my mom ever baked, tasted like my childhood: the simple pleasure of living in that old house, family and a kitchen full of good things to eat. A few weeks ago I baked a blueberry pie. To remind me of my sweet childhood and to build some sweet food memories for our child. I watched a lot of TV when I was a kid. A lot. But I’m glad to say that I was raised on a healthy diet of cooking shows. And The French Chef was the first one I lapped up. 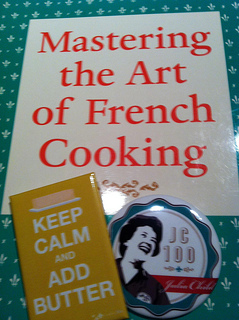 I was fascinated by Julia Child. Drinking in her detailed instructions and staring intently on the TV tube, I didn’t miss a single flip, dice or stir that Julia did. At the time, I had no idea about the mystique of French cuisine. Nor did I really understand her tongue in cheek humour. I was just mesmerized by a completely wonderful world of food that was so different from my own. Today I, like many food enthusiasts worldwide, am celebrating Julia’s birthday. Happy Birthday Julia. Thank you for all your morsels of wisdom. Bon appétit!